Extremely Niche Relevant Powerful Dofollow Backlink for your website. Reddit is one of the most popular websites on the internet with 1.7 Billion Monthly Visitors With 70% of the visitors are coming from the US. This Service gets you a Niche Relevant Permanent Naked URL Anchor DA99/TF68 Do-Follow Backlink from Reddit, These Backlinks works like a charm. A few of these backlinks can skyrocket your rankings depending on the competition. You send us the Link and we flip it to Do-Follow on Reddit, Simple As That. PM us for the sample. This service gets you Niche Relevant a Permanent Keyword/Anchor Choice Do-follow Backlink from Reddit. We will write 50-100 words article about your provided link or website & we will create the backlink on your chosen keyword or Anchor from Reddit. Also, this backlink works as like as a niche relevant guest post. This backlink can skyrocket rank your keyword. Important: We will do only naked URL anchor do-follow backlinks for the basic service price $9. If you are interested to buy keyword/anchor choice do-follow backlink, please choose the extras service below. If you are not satisfied with our work then we will give you 100% refund without any questions. Q: Can I get traffic from this backlink? A: This is a niche relevant backlink. So you have a chance to get traffic. But traffic is not guaranteed. Q: Can I see the sample of the Dofollow backlink? A: Yes, Please PM me. I will send you the sample. Q: Do you provide the report once the order is delivered? A: Yes, I will send you the full report. Order us & get a powerful Dofollow Backlink on Reddit. 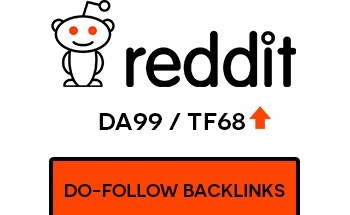 Powerful DA99 Niche Relevant Dofollow Reddit Backlinks Google Index Guarantee is ranked 5 out of 5. Based on 47 user reviews.